A shift in NATO protocol for sanctioning aerial bombing in Afghanistan was accompanied by an 81-percent drop in civilian deaths from airstrikes over the course of six years, a new report suggests. The report, published by Action on Armed Violence (AOAV) on Tuesday, investigates tactical policies implemented by NATO in Afghanistan between 2008 and 2014. 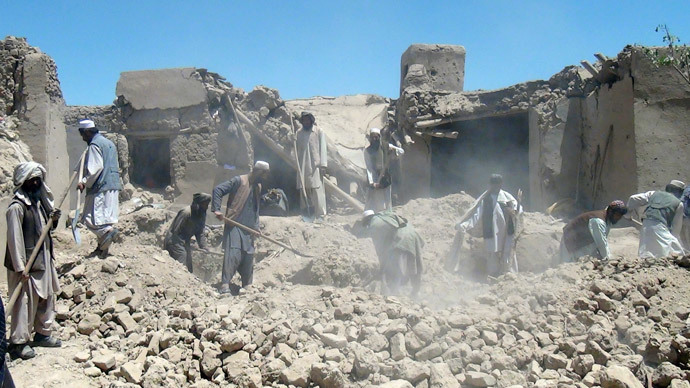 AOAV’s research was centered on two overarching questions: how did the military alliance alter the rules governing its use of aerial bombing in parts of Afghanistan populated with civilians, and how did these policy shifts aid in the protection of civilians? The charity examined three polices and directives enforced by NATO officials post 2008 – the McChrystal Tactical Directive (2009), the Allen order (2012), and the Karzai decree (2013). The changes in protocol were accompanied by a 24-percent drop in “violent civilian deaths” from NATO airstrikes in the region between 2008 and 2013, the charity’s report suggests. “Collectively, the tightening of the rules provided a clear example of how changes in military operations can go beyond existing laws without jeopardizing key military objectives,” AOAV concluded. Policies embraced by NATO between 2009 and 2013 were characterized by a number of core features, the report said. Each focused largely on limiting the use of “aerial explosive weapons” in populated districts of Afghanistan. NATO's alternate approach reflected an increased awareness of the dangers of bombing areas where civilians commonly gather, said Robert Perkins, the report’s author. NATO’s deployment of airstrikes in Afghanistan has generated a firestorm of criticism in recent years. Civilian deaths from airstrikes peaked in the war-torn state in 2008, where 552 died. This figure fell to 106 as 2014 came to a close – the year international forces withdrew from the region. While NATO has put a system in place for monitoring civilian deaths and casualties, not all members of the alliance have effective policies for tracking the impact of NATO airstrikes on civilians. Challenged by AOAV, the British government said it doesn’t have a system for recording total figures for civilian casualties in Afghanistan. Iain Overton, Director of Policy at AOAV, said the termination of NATO military operations in Afghanistan marks a time for reflection. “NATO recognized that even with well-trained and well-equipped militaries, mistakes were still made in Afghanistan that meant far too many civilians were being killed by their bombs,” he said.